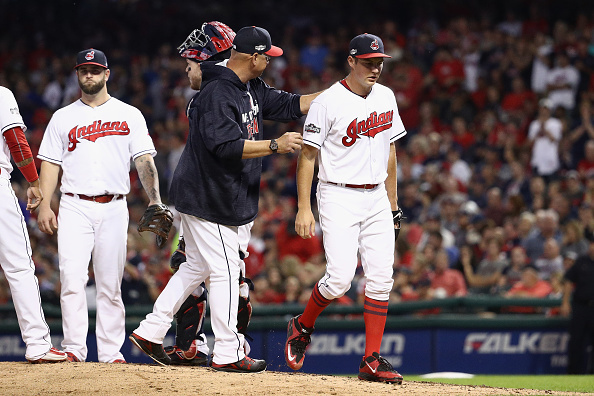 Coming into the MLB postseason, the Cleveland Indians were essentially declared dead in the water thanks to the damage they took on with their rotation. Depending on Corey Kluber, Trevor Bauer and Josh Tomlin was hardly ideal, and many assumed the Boston Red Sox were going to feast on a team with key injuries to what was easily its biggest area of strength. One sweep later, things appear to have changed. Bauer and Tomlin held their own, while Kluber was his usual dominant self. Together, these three shut down one of the most powerful offenses in the majors and helped the Tribe punch a ticket to the ALCS. As exciting as this is for the Indians, a new series brings new questions, especially with pitching. Now facing a seven-game set with a scorching-hot Toronto Blue Jays team, Cleveland has some major calls to make in determining how the starting rotation is going to look. Barring any last minute setbacks, the first three starters should be the same – Kluber, Bauer and Tomlin. As of this writing, the Game 1 starter is still to be determined, but that’s the only real mystery for the first three contests. However, things get very interesting once we get to Game 4. There are more than a few options available for Cleveland, each coming with its fair share of risks. The first is running whoever pitches Game 1 back out to the mound on four days rest. Depending on how long said starter goes in the series opener, this might not be a bad route to take. That said, it could hurt the Indians chances if their starter is pitching without fully recovering from his last appearance. Another option is utilizing a fourth starter. This would make some sense on the surface, at least until you consider the team’s available choices. The most likely picks would be either rookie Mike Clevinger or Cody Anderson. Obviously, either of these choices is soaked in risk. Asking Clevinger to take the mound in Game 4 – which will undoubtedly be a crucial moment to say the least – is a situation which could backfire in a hurry. That the game would be taking place in front of what’s sure to be a raucous Toronto crowd only makes the stakes higher. As for Anderson, he’s coming off a particularly rough season in which he won only one start and posted a 6.68 ERA. It’s not exactly a line you feel comfortable relying on. Outside of these suggestions, the only other feasible option is to have a bullpen game. The Indians fell back on this strategy late in the season when their rotation first started taking on damage. They would ride a starter for a few innings, then start leaning on relievers to finish out the contest. It can definitely be effective, especially with how well the Tribe’s bullpen has been performing. At the same time, this, too, isn’t bulletproof. Cleveland’s relievers played a big role in beating the Red Sox, but depending on them for a full game will only tax them further. Having Andrew Miller and Cody Allen continuing to throw 40 pitches a night is only going to weaken two of the team’s best relief weapons. The potential addition of Danny Salazar to the mix will definitely help, but with the bullpen already taxed to this point, the Indians need to be careful about adding more strain. As you can see, there are numerous approaches the team can take, but each has its flaws. We’re sure to find out Cleveland’s plans soon. How the team goes about planning its ALCS rotation will certainly have a significant impact on what to expect in this series. The Indians excellently game-managed their way through their bouts with Boston, and will need to continue this trend if they want to keep their World Series dreams alive.